Elton Chigumbura, the Zimbabwean allrounder, has been signed as Northamptonshire's overseas player, and is expected to be available for the entirety of the upcoming season. "We are pleased to confirm that Elton will be joining us for the 2010 season," said David Capel, Northants' head coach. "He is a talented young, athletic cricketer who has already played in over 100 ODIs for Zimbabwe." 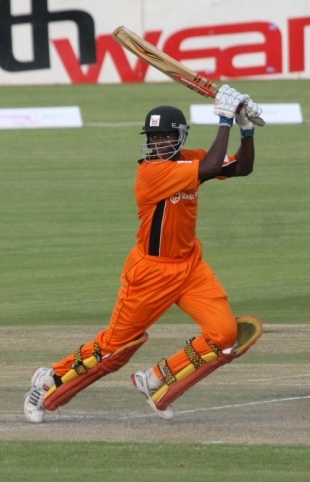 Chigumbura was thrust into international cricket as an 18-year-old in 2004 in the midst of the disagreement between the Zimbabwe board and the 'rebel' players, and has since established himself as the side's only genuine allrounder. In 108 ODIs he has scored 2241 runs, with 13 half-centuries, and picked up 79 wickets at 35.97 with his fast-medium seamers. "It is clear through watching him play against the West Indies recently, that he is an energetic, effervescent and enthusiastic cricketer, who is very keen to improve his game," added Capel. "I know that Elton sees this as a massive opportunity, and is looking forward to joining us as soon as possible." Northants' second new signing is Vishal Tripathi, the Lancashire-born batting allrounder. Tripathi, 22, has been brought in on an initial three-month deal, with the potential to move on to a longer term contract. "This is a good opportunity for Vishal to impress everyone at Northants Cricket during his initial three-month phase," said Capel. "He is a bright, young all-round cricketer." "I'm delighted to have signed for Northants Cricket," said Tripathi. "I've been given a great opportunity to show what I can do at 2nd XI and 1st XI levels. I'm grateful of the opportunity and hopefully I can show everyone what I can do as an up and coming young player."